Rivalry trophy series: History Runs Deep and Battle for the Megaphone! Clu is back with his Rivalry Trophy Series! Today, he looks at a California rivalry and the Battle for the Megaphone. Thats right everyone, it’s already week 3, and we have our first Rivalry Trophy Series to bring you! Jeeze! I almost didn’t have time to prepare myself for this. Anywho, you might remember that last season I debuted the Rivalry Trophy Series going over some of the more interesting trophy games between universities throughout the country. I introduced to you all to the world of college rivalries, to show you that there’s real football that doesn’t take place on Sundays. So, among the big named and not so big named programs (Remember our Shula Bowl post? ), you will find that rivalries do exist between colleges, and some of them run very deep. So here we have an example of a big time rivalry, as we kick off the Rivalry Trophy Series for 2012 with the Battle for the Megaphone, along with a very historic rivalry that runs deep through California. Enjoy! As previously stated… History runs deep. Stanford is USC’s oldest rival, with meetings going all the way back to the turn of last century. That’s right kids, Stanford and USC have been pounding it out on the gridiron since 1905! Let me just tell you about some notable things that happened in 1905: Las Vegas was founded, The Cubs beat the Phillies in 20 innings 2-1, Ty Cobb made his baseball debut and New York City’s famous Hippodrome Arena officially opened. Now, wasn’t that informative?! Anywho getting back to this… USC and Stanford, being that they are both private universities with major football teams that share the same conference on the west coast, naturally have developed a sort of crass towards one another. Each school saw periods of success from the 60s to the 80s, but lately the rivalry has taken a back seat, especially during the early 2000s. This was in large part due to the dominance of USC during the Pete Carroll, Matt Leinart and Reggie Bush era. 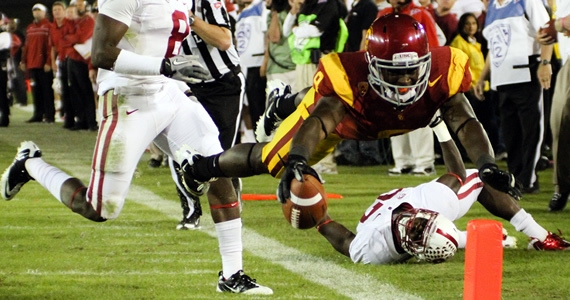 However, the same cannot be said for USC for the 2nd part of the last decade, as Stanford has won four of the last five meetings between the schools. This is, in large part, due to former QB Andrew Luck and former head coach Jim Harbaugh. Ever since this reversal of fortune, one of the Southern Cal newspapers has deemed fit to place Stanford on USC’s top 5 “Must Kill” list. The Cardinal will still be the underdog at home against the No. 2-ranked Trojans tonight. They seemed to look more like the team that everyone has talked about as top contenders in their 50-13 drubbing of Duke last week, than when they won 20-17 in week 1 against San Jose State. Southern Cal, however, has been a dominating powerhouse at the top of the NCAA, fresh off a 42-29 victory over Syracuse (although to be honest, the Orange did give them a run for their money there for a little bit. I should know… I was there). They can run down your throat and they can pass the ball too. I do, however, question their defense, as it did manage to give up 29 points to Syracuse and they have yet to face a REAL team like Stanford. I guess we shall see who comes out on top. Prediction: Home field advantage won’t help Stanford in this one because USC is just too good. Southern Cal takes this one. Another historic matchup, this one started way back when in 1897 and, although these two teams did not play each other annually until 1949, Notre Dame was the clear better program. That was until the megaphone was brought into play. The Megaphone was sponsored by the Detroit Alumni Clubs of both universities. It is half blue and half white and includes the results of all of the previous games. The Spartans have won seven of the eleven battles since 2000, and many of the games have been exciting. The most memorable moment, for me at least, was in 2010. The two teams went back and forth all game, and it ended up going into overtime. With the Irish leading 31-28, Michigan State appeared to be going for a game-tying field goal to send it to a second OT. All of a sudden, the Spartans faked the field goal! Aaron Bates, the holder, tossed a game-winning touchdown pass to TE Charlie Gantt to win it 34–31. The play was dubbed “Little Giants” (after the movie of course) and the crowd went bananas. In fact, the Michigan State coach ended up in the hospital after suffering a heart attack after the game (no really he did) and you can see it all in the video embedded below. This year’s game should have all of the excitement that both Irish and Spartan fans are looking for. After a tough 31-13 loss in South Bend last year, Michigan State looks to reclaim the Megaphone from the Irish. Prediction: I think home field helps the Spartans win the Megaphone this year. Will it be an exciting game? You sure bet! Spartans win this one though.